Of Manuel Saumell. 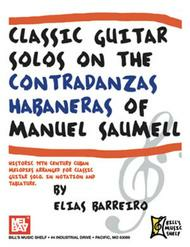 Composed by Elias Barreiro. Solos, Style, Perfect binding. Bill's Music Shelf. Latin American. Book. 96 pages. Mel Bay Publications, Inc #20275. Published by Mel Bay Publications, Inc (MB.20275). ISBN 9780786671571. 8.5 X 11 inches. Presents the Contradanzas Habaneras of Manuel Saumell (1817-1870), who has been called a Pioneer of the Cuban danza. 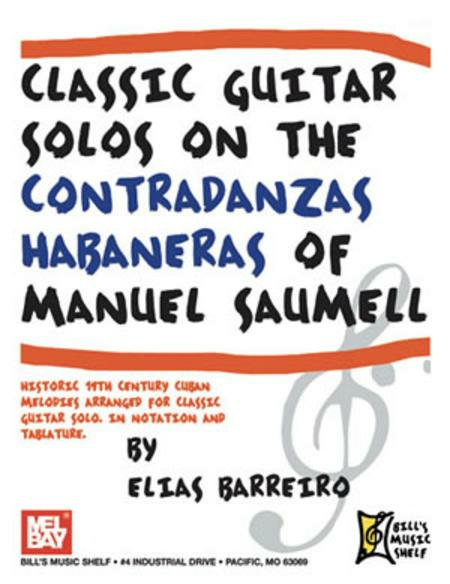 Originally written for the piano, this collection of contradanzas is a good example of Saumell's innate sensitivity to the rhythms characteristic of Cuban Music. Written in standard notation and tablature.